Here is some recent data on the Helix nebula. It really need more exposure, but it didn't turn out too badly for just over an hour's worth. Click on the image to see an earlier attempt takes several years ago. Schedule permitting I'll be collecting more on this target so check back every so often. Processing This image was processed entirely in Images Plus 6.5 beta 4a. 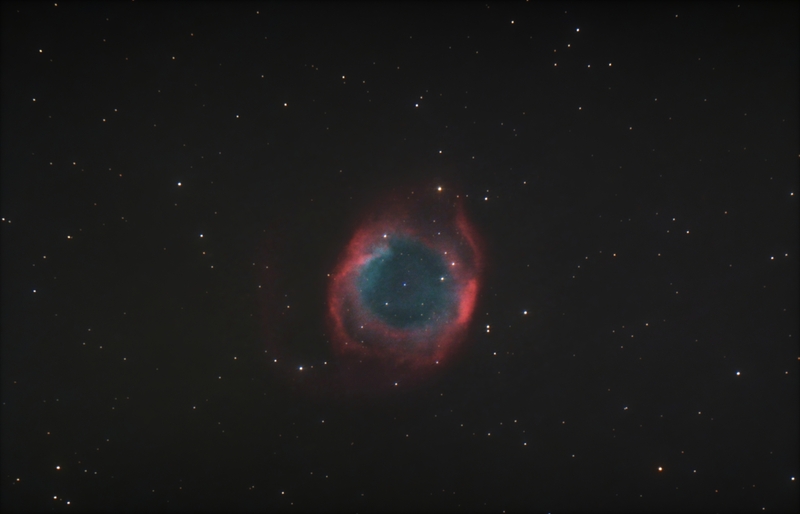 Calibration, stacking, masked arcsinh stretch, feature mask split star processing in Images Plus . Masked noise reduction, sharpening and contrast enhancement done with multiple iterations of the multi scale decomposition tool with a masked combine. Band reduction using Mike Unsold's advanced band removal technique. Image binned and cropped for web display.